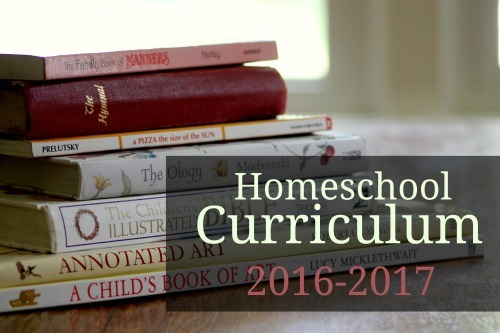 Our homeschool has always been defined by learning-a-la-carte. We are eclectic and refuse to be boxed in by any one method or mantra. Naturally, my curriculum choices for 2016-2017 reflect my pieced-together style. In the upcoming school year, I'll have one child in junior high, three in elementary, and one in Pre-K. No doubt, it will be a full year. As in year's past, we will stick with a four-day-a-week schedule. So, you can assume that the following items will be used four days a week unless otherwise indicated. Items with asterisks are new-to-us this year. Our morning time consists of the two most important items on our daily docket...Bible/faith building and pleasure reading. In my humble opinion, if we are able to start our day together surrounded by good books and The Book, I consider the day a success...even if the rest of the day morphs into complete chaos. Our morning basket will be quite full this year. Some items will be done daily, while others will be placed in a "loop" (similar to my housework loop) to ensure both consistency and variety. To be placed in a "loop"
For the first time EVER, my house will be divided when it comes to science. In preparation for some dual enrollment classes she would like to take in two more years, my daughter has opted to take a more traditional approach to science this year by using BJU Earth Science. (More on that to come.) This will pull her away from our group learning a bit. But, in an effort to at least make our conversations and learning somewhat parallel, I will be creating shortened unit studies for my boys that match those of her science program. Admittedly, that's a lot to cover in nine months--a whole lot more than I'd recommend. To me, it feels like I'm in for a year of casting my net a mile wide but only an inch deep. But, while I love well-developed, lengthy units, I must admit that I love FAMILY-style learning more. So, in an effort to keep both my daughter and my boys on a similar page, I'll stay in the shallow end of science this year. As in year's past, I will create homespun living-literature units using resources from the TruthQuest list, our own personal library, and the public library. We will continue to plunge through the Middle Ages and head straight into the Renaissance and Reformation sometime in the latter half of the year. our homemade history notebooks- These are notebooks that we've been making and adding to since the beginning of our Ancient Egypt unit several years ago. Our year of homeschool hygge has given us a renewed excitement for co-operative learning. It helped us re-focus and re-fuel. This fall, we will be joining with two families that we have done cooperative learning with in the past to form a new co-op. We are intentionally keeping the group small in order that we may meet in homes and grow the same sense of family community that we enjoyed last year during our hygge. Once a week for one of their child-of-the-day responsibilities, each of my four older kids will take turns reading through a few pages of a National Wildlife Federation preschool magazine with my youngest son. (I was able to pick up several dozen outdated issues at a garage sale and will present him with a "new" one each week.) Each magazine features fun stories, games, songs, and facts all about different animals. This will be a small piece of my son's daily preschool time; but one in which I do not have to tackle myself. My little guy will love the one-on-one time with an older sibling each day. And I will love the extra reading practice that my older kids will have once a week (Nothin' like sneaky learning!) It's a win-win! I'm taking so many things away from this post! I've written out our schedule for next year, but I was afraid it was too "busy" and would result in us feeling frantic or constantly behind. I've already implemented some of your processes for read alouds and mom-selected books. This year, I think I want to try the block scheduling for history and science. I've also been feeling a little guilty that my kids aren't in a co-op. With my work schedule, it simply wouldn't work though. I like the idea of planning something twice a month with another family. I want to reach out to a few families today to start that conversation. Do you have any suggestions for getting something started? Yes, block scheduling works so well for history and science. That way, you can dive a little deeper each day instead of feeling rushed. Regarding the co-op, don't feel guilty. AT ALL. You have to do what is best for your family. And for a season, that might mean no co-op. If you'd like to do more of a hygge type group, perhaps start by jotting down the names of two or three families who have similarly aged kids and who seem to have the same parenting/faith values. Send out an email to them detailing what you were hoping the group to look like...how often you'd meet, if there would be a meal, if you would meet at parks or in homes, etc. If you get any interest from those families, meet over coffee to figure out some of the logistical details. It worked best for us to do it every-other Tuesday, but maybe your group needs a more whenever-we-are-available approach if your work schedule doesn't permit you to commit to a particular day each month. I encourage you to check out R.E.A.L Science Odyssey Earth Science from PandiaPress for your younger ones joining in on big sister's science topics. It is inexpensive, group learning friendly and so so easy on Mama to plan. I download it and print what I need, that is all. Easy Peasy. Their science curriculum has been a God send for us. Best wishes on your school year! I recently came across your blog as I was researching and comparing curriculums online. I have been homeschooling for 2 years, I have a 6yr old boy who is almost finished 2nd grade in his core subjects and a 3.5yr old girl who completed All About Reading Pre Reading program, as she really wanted to be included in school. I also have a precious 5 month old baby boy! We live in Central Texas, on 200 acres on the Guadalupe river. I love homeschooling my littles. You write so well and your content is rich with your wisdom and experience.....and so much great advice. Your children seem lovely! Thank you for taking the time to put all this information out there. I just purchased the planner you use, I want to show my support for such a great resource you have here. 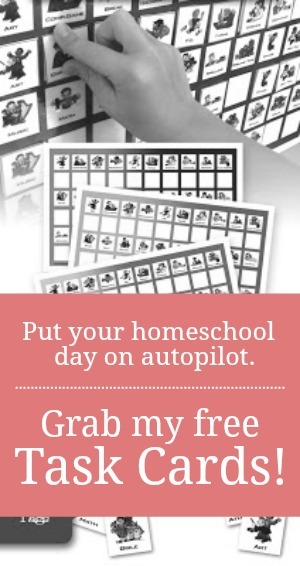 I have been using homeschooltracker online as I wanted to have our schooling documented and to be able to print attendance reports and report cards. I also was using a book planner as I prefer to 'write' out my plans and schedules. The online tracking has been a bit time consuming so I am not sure if I should continue. I feel it adds a level of 'professionalism' to my record keeping...but not sure. Have you ever used a software program to plan and keep track of your school? Again thank you for your great blog, I look forward to reading more in the future. Many hugs from Texas! Martha, Welcome. I'm so glad you stumbled upon my blog. I hope it is an encouragement to you. No, I've never used any digital planning apps or programs. I'm just not that tech savvy. Plus, since I run my business from home and that requires a lot of screen time, I prefer to have all my non-business life away from a screen. So, the paper planner is perfect. How do your children take to learning theology? I do character trait studies with them, but I thought they may be too young to learn theology. Now I think I just may be able to incorporate it into ours. Especially since I've adopted a similar approach to homeschool 4 days a week all year round. Can you give me an idea of how much time you spend on your morning basket each day? It is usually about 15 minutes. On Fridays when we read a chapter from a missionary biography, we can spend up to 30. I like to keep it short because I still have little ones whose attention spans aren't very long. I'm very much done with Common Core math and will be homeschooling next year. (there are other reasons for the change, too, not just math!) This is my very on-line search for homeschool info & I'm so glad I found your site! Very informative & helpful - thanks!!!!!! !